Why are we the way we are, Ben? I don’t know what you’re talking about, Mr Daniel. Did Quentin actually die at sea? We’re a family born to tragedy. We seem somehow to invite it, and then thrive on it. What’s wrong with us? You just try and get some sleep. I know all about you! I’m gonna tell everyone, so you’ll be destroyed! 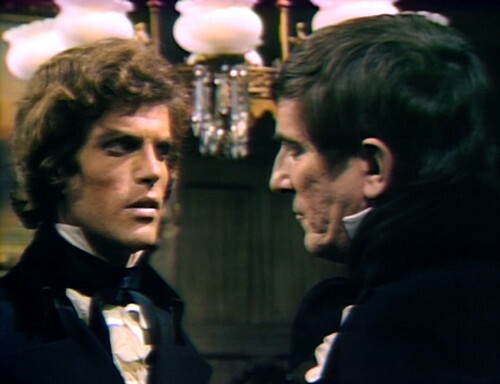 It’s so strange… seeing Barnabas, and hearing about the attack on poor Roxanne… made me think back to the winter of 1797. On the contrary, I feel great sorrow when people die. I might even be sorry if you die. All the terrifying things that happened… the strange and vicious attacks in the village… the rumors about Angelique! The suicide of Barnabas Collins’ mother! Would you prefer her to die here in Collinwood, alone in her bedroom, or in town, where there are witnesses? I hadn’t thought of that. I rather like her dying in front of witnesses. What happened, Ben? What caused it all? I don’t know, Mr. Daniel. Are you trying to tell me that you don’t believe my story? I’m not trying to tell you anything. What frightens me is the terrible feeling — it’s going to happen to us again. Some incredible horror that none of us knows anything about yet! They marked it down as a suicide. The frightening thing was, that Ben had looked like he’d cut his own head off. Oh, and by the way, I’m not using arsenic. What happened? What caused it all? Tomorrow: House of Hurt Feelings. Gabriel tries to step on Gerard’s line, when Gerard talks about minimizing his own risk. When Samantha approaches Edith in the playroom, a studio light is reflected in the window. When the scene shifts from the playroom to the drawing room in act 2, we can see the top of Gerard’s head as he dashes by the camera to get into place. Edith visibly reacts for a second, and when the camera pulls back to reveal Gerard, he grins. When Gabriel looks at his pocket watch and says “Six o’clock,” we can hear someone flip a page in the script. Then there’s a scraping sound which is supposed to represent the horses pulling Gerard and Samantha’s carriage away, but it’s pretty hard to identify. As the clock starts to strike, there’s another page flip. 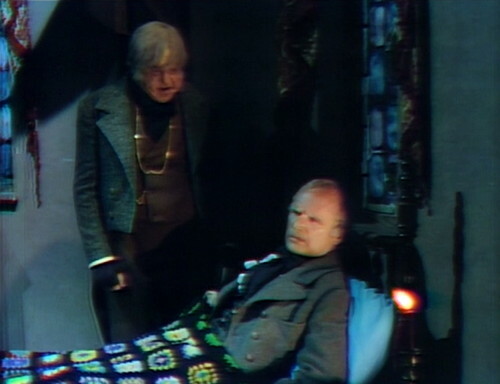 When the show visited 1897 back in March 1969, Edith Collins was an old, dying woman who knew a family secret that had to be passed to one person in each generation. 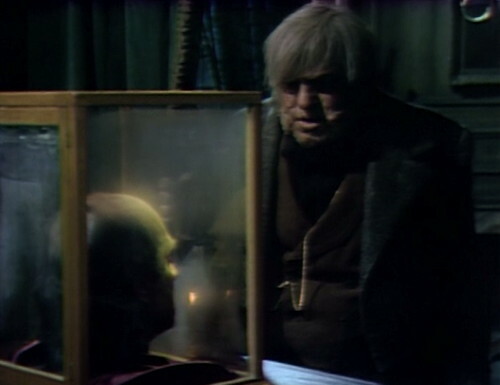 The secret was that Barnabas was a vampire chained up in the mausoleum, and when Edith was introduced to Barnabas, she knew instantly that he was the secret. Now, the obvious route for the secret would be Joshua to his nephew Daniel, and then to Daniel’s daughter-in-law, Edith. But we saw yesterday that Daniel didn’t know about Barnabas’ secret — so maybe it passed from Joshua to Ben, and then Edith. But today we see that Ben dies, apparently without passing it on to Edith, because she doesn’t react to Barnabas in the same way. So who told Edith, and when? Another note: Samantha mentions Edith’s son at boarding school, but doesn’t refer to him by name. When that boy grows up, he’ll get married, and we see his grown-up children — Edward, Judith, Quentin and Carl — in 1897. The names of both parents in that middle generation are never revealed on the show; this is one of the important missing pieces in the Collins family tree. And we see the Smith Brothers mustache portrait hanging in the Collinwood foyer today, in the spot where Barnabas’ portrait usually hangs. We last saw it in 1995, at Professor Stokes’ place. Ben can have two boxes now. Aww, it’s awful! Who will care for Mad Daniel now? Joshua never would have told anyone about Barnabas. That’s why he altered the family history to say that he went away to England on business. And the family history was the version of events that was handed down, which is why it was such a surprise when Barnabas “arrived” at Collinwood in 1967. Just the mere act of passing such a secret through the generations would have increased the chance of releasing Barnabas from his coffin and plaguing the countryside once again with the curse. The Collins family tree is more like a cactus — just three or four branches that we can see, and with lots of prickly stuff that gets in your way if you try reaching out to examine it. 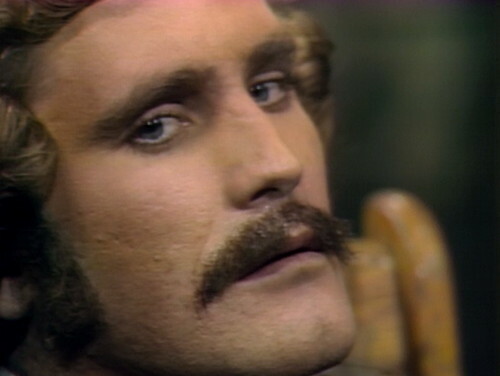 And what is Ben even doing at Collinwood, let alone being still alive? In 1968, Professor Stokes revealed that along with his freedom he was given a parcel of land just north of town and died somewhere around his 70th year, which would have been around 1830 or so. Is it possible that 1795/96 was changed to 1797 to call up associations of 1897, a nice “round” number to remind viewers of the show’s most successful story arc? And, finally, what’s with having the actors who play in each episode stare toward the camera during the opening narration as they are mentioned? Is this just a 1970 thing with daytime programming, or is Dan Curtis just vaguely borrowing from Rod Serling’s Night Gallery, as if to say “tonight’s guest stars”? Thanks Prisoner for talking about the opening narration during this time of the show. I have been curious about how the opening narration was handled during this initial 1840 time travel story – so it’s not just a still of the “great house” but shows the different characters in that episode? Danny, if you haven’t already, could you maybe describe, maybe even in more detail, what they are doing in the opening narration during this time? Just curious. This is more evidence to me this is a different parallel time. I like those portrait still type moments in the opening narration and wish they’d been doing them all along. It’s especially nice when the actors are done up in period costumes and hair styles. Yes, the “family secret” storyline in 1897 is suspenseful and fun, but it doesn’t make any real internal sense. Generally speaking, no one is going to break into the secret room (it’s a secret, after all). And you already have sufficient motivation for the family to guard the mausoleum — their ancestors are buried there. Willie, the grave robber, was a sort of perfect storm with Elizabeth being in such a compromising position that someone like him would even be at Collinwood and get the idea that there would be jewels to steal from Naomi’s grave. Also, Willie accidentally opened the secret room by trying to pull open Naomi’s coffin lid (this is different from HODS and the 1991 revival where there’s this ridiculous riddle that leads people to the secret room). Also, how old is Joshua in 1795? Probably 60 at the youngest. When would he have this difficult conversation with Daniel? If it’s when Daniel’s an adult, then it would likely be received as the deathbed confession of a senile old man. However, the Eagle Hill caretaker did warn Willie at first of an “evil force” that existed inside the mausoleum, and that it wasn’t safe to venture nearby at night. They kept adjusting Joshua’s age as they went along. Fifty or 60 would sound about right, but then the life dates showing on the plaque in the mausoleum were something like 1755 to 1830. But that was before the 1795 story, and they never revised them — even after the show had been through 1795, Naomi’s plaque still had her listed as dying around 1821. Sometime in 1968, I think, I think it was said that Joshua was supposed to have died somewhere around 1805, so Daniel would still have been still in his teens. Juggling all the story inconsistencies is a challenge for sure. They’re just too many and too vast to take in without writing it all down. Yes, each story exists in its own world. Ultimately, all that matters is 1795, which is the primary backstory for the majority of the story arcs, especially 1840. The references to Edith is mostly just Easter Eggs. All that really matters for 1840 is Barnabas, Angelique, and Trask from 1795. How about a secret order of caretakers, who are tasked with warning those wandering through Eagle Hill if there’s evil around? Well, the one we saw had ghostlike qualities – appearing seemingly from nowhere, always repeating the same warning; who’s to say he’s not the only caretaker, and has been for centuries? Doomed to give the warning that went unheeded when he was alive. 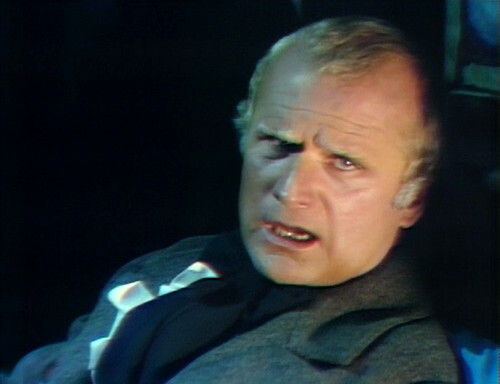 I couldn’t agree with you more about the “family secret.” I remember the first time I saw the episode in which Edith points at Barnabas and shouts, “You’re the family secret!”, that just ruined that whole story line for me right there and then. Mostly because it simply doesn’t make any sense. For starters, at the end of the 1795 story line when Joshua didn’t have the heart to kill Barnabas, and had Ben chain him in the coffin. And then in a very professional, yet profound manner, handed Ben a handsome sum of money as a reward for his loyalty to the family. I will never forget that episode and it ranks high as one of my all-time favorites. I can’t imagine Joshua telling the secret to anyone either unless it was a deathbed confession to Daniel. Knowing Barnabas could potentially be released from the coffin in the years to come had to weigh heavily on Joshua’s mind. Passing the secret on to designated family members over the years would make sense, just for safety’s sake if nothing else. That knowledge might be what drove Daniel insane. Daniel, in turn, confiding the secret to Edith seems unlikely but, in his confused mental state, Daniel might have turned to her simply because she was kind to him. I kinda liked the scene when Grandmama Edith screeched “You’re the secret!” at Barnabas!! It was so unexpected and the look on Barnabas’ face was priceless. That patented, “I’m your long lost cousin from England” routine didn’t work that time! Changing the family history was for public consumption. Joshua might well have entrusted the secret to someone to make sure Barnabas never got out. 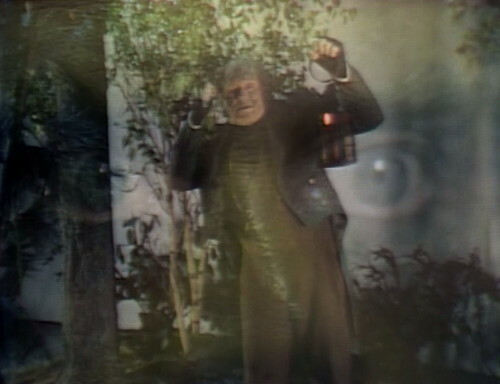 I’ve been on a slight Night Gallery “binge,” so I couldn’t help liking that comparison. Yes, what a great show. 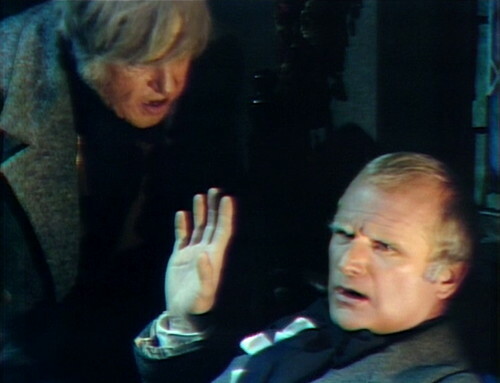 I’ve lately been binging on the later seasons of Twilight Zone, so I think I’m due for another run-through of Night Gallery. 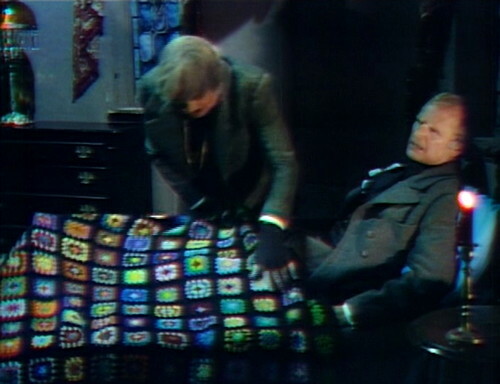 Prisoner, have you watched “The Tune in Dan’s Cafe” on Night Gallery? I ‘d love to discuss that one with you. Oh yes, I have all the Night Gallery DVDs and have watched the series once through, and some episodes several times. I had to look that up to refresh my memory, and the description of the jukebox playing only one song rings a bell. I’ll view it again tonight, and would enjoy discussing the story with you. Bob, the jukebox in “The Tune in Dan’s Cafe” is the same as in the Blue Whale — a Seeburg Select-o-Matic 100. 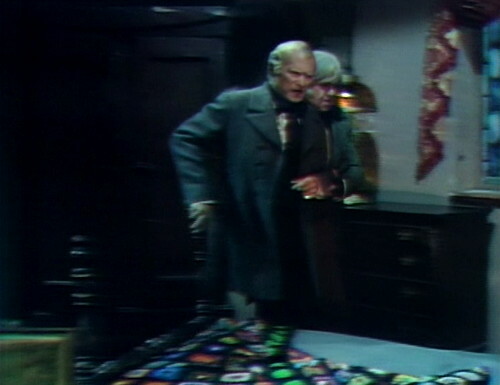 In some Dark Shadows episodes you’ll see strips of masking tape over the glass, because at the time it was against network policy to show brand names of products (i.e., “gratuitous plugs”). On a musical side note, I’ve been going through my every so often binge of Kolchak: The Night Stalker. 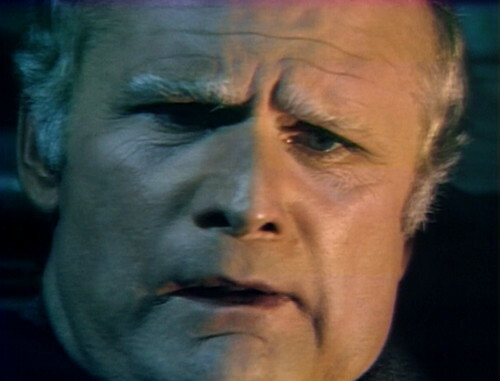 I watched an episode of Kolchak before this Night Gallery episode, and I never realized before that the theme music for both shows was done by Gil Mellé. I remember enjoying the original episodes (‘back when’), but being very disappointed with the reissue, which padded out a lot of vignettes with completely unnecessary footage, and added in “Sixth Sense” episodes (which were chopped up to fit the half-hour format). Night Gallery was the first (U.S.) TV theme to be done completely by electronic instruments. 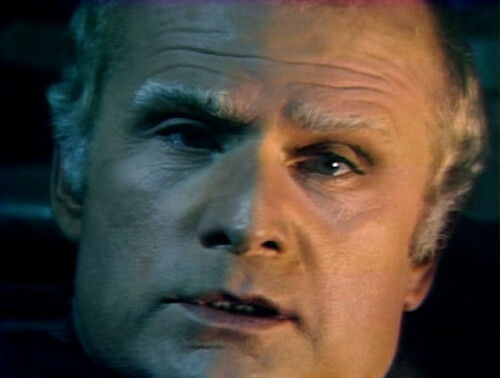 In an earlier episode, Elizabeth states her great-grandfather was Jeremiah Collins. I know that was before the Barnabas retcon that pushed Jeremiah back another 70-odd years. But I still like to think that Gabriel or Edith named him to honour that relative. What timeline do we think we are in now? The original Phyllis Wick timeline or Victoria Winters? Does anybody mention Vicki’s name during 1840? She’s long been forgotten, only mentioned after her departure in the Leviathan storyline and when Barnabas is trying to catch Tad possessed David out. Yes, to the latter question. Would Vicki (and Peter) still be alive – even if not still in Collinsport – in 1840? Vicki was in her early 20’s at the start of the show (around Carolyn’s age), vanished into 1897 on last revision, so assuming Vicki didn’t die by Jeb’s hand, she’d be in her 60’s or 70’s. Maybe she’s fallen afoul of a coven of witches who send to back, to the future. 1795 was the most daring and innovative time travel arc. 1897 is generally considered the best time travel arc (I liked 1795 better myself, but then I like “Macbeth” more than “Hamlet”). From 1795, we have Daniel Collins, Ben Stokes, Barnabas (the body), Angelique and the son of Rev. Trask, Lamar. And a big part of 1840 action springs from the reverberations of 1795. Then we have Julia, Barnabas (the soul or life force or whatever you call it) and eventually Elliott Stokes visiting from 1970. And they were on this journey because of what they saw in 1995. Even 1897 gets a nod with another Quentin variation and the presence of Edith Collins. Events from the 1600s come into play, as well as the East Wing PT room again eventually. So you have ALL of that plus the brand new 1840 stories of Samantha, Leticia, Gabriel, Head in a Box, Flora, etc. It’s really kind of breathtaking, when you think about it, that a couple of writers and this tiny show attempted something so complicated. And despite some pretty big time travel conundrum, paradoxes or goofs, it actually holds together remarkable well in the big picture. 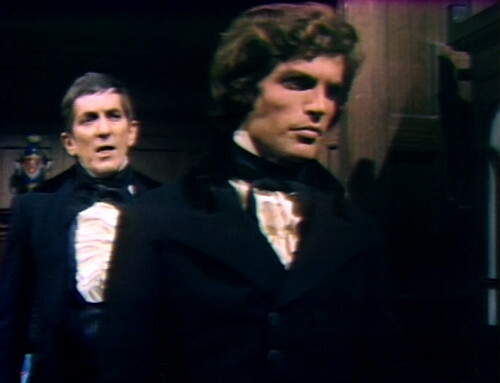 By now I have a relationship to all the story arcs, but back in the days of original broadcasts (it’s actually hard to put this together now), I joined Dark Shadows during the Adam story arc, barely connecting with the Dream Curse and Cassandra: this means I fell in love with the show with no connection to 1795 or Barnabas’s reinserting onto the 20th century. Barnabas wasn’t a vampire for me until Angelique bit him, I never knew the origin of his vaguely-identified curse until I read a brief account in on of the Marilyn Ross novels, and even then I didn’t understand why in 1897 Angelique referred to herself as Barnabas’s wife; I never got Josette except by dialogue references and an incomprehensible flashback now and then; Vicki and Peter Bradford I had to take on faith and incomprehension–I was glad to see them fade. And I still fell in love with the show –Nicholas Blair was a draw (this was the start of Maggie’s ingenue phase, so I never realized how much she dwindled into a damsel), Angelique as vampire certainly fascinated me, and I was on board for the whole Quentin arc (even though I had no idea who Laura Collins was). It was actually surprising how much you could “do” Dark Shadows back then with only a partial understanding–later that got harder! But that meant that I entered 1840 with no sense of the poignance of mad, damaged Daniel and faithful, helpless Ben Stokes, didn’t see the rewards the writers were placing for fans-from-the-first. Now I return to it and the deeper feelings I missed the first time are here for me. I agree with William–even as the show was dying, they made bold, imperfect moves to tie things together, to make a new story resonant with old ones in a pretty remarkable way, a way predictive of 21st-century extended narratives and trans media storytelling. And, dammit, ultimately, it was that combination of heedless storytelling ambition and forgivable shortfalls that won so many fans’ hearts–we loved Dark Shadows more for the fact that we had to invest in its aspirations, forgiving the flaws and seeing beyond the contradictions by sheer personal dedication. The sometimes amateurish acting, the momentary line flubs, prop mishaps, and fizzled special effects, the larger missteps of bad story arcs, clumsy retcons, fumbled endings, and time-travel mismatches were all challenges to our faith, challenges that we proudly overcame–that’s what made up true believers. Because the courage to refashion the great horror narratives and film genres, the ranging from soap love triangles to Romantic novels to the halls of Dibolos and generation-spanning obsessions, hauntings, love affairs, and revenge, the splendor of the costumes and the spit-and-scotch-tape theatrical elegance of the sets, the determination to do more than they reasonably could, all that nutcase aspiration was so rare and so moving, those of us who loved it knew it was worth the cost of all its failings. Hell, the failings reinforced the Quixotic reach of its dreams: It was a fandom-creating machine. Very well put. I think you and I started watching DS around the same time. That’s a beautiful tribute to “Dark Shadows”, Michael. Strikes many chords with me, too. Thanks for posting! Now, I started in 68. So I, although been through it six times now, felt much like you back in 2012, when I rediscovered it. Daniel’s line “What happened, Ben? What caused it all?” strongly suggests that the writers were thinking ahead in this storyline since, after all, they get around to revealing the “spark” that set all subsequent Collins family troubles with the supernatural into motion. I know that Danny and I disagree about the extent to which the DS writers indeed planned things in advance. Then again, they really do much up the whole Edith thing, if I remember correctly — and much more than in the ways that Danny discusses above. That should be “muck up,” not “much up.” Doggone the lack of an editing function! Funny, how the timeline in DS wiki leaves out both Angelique’s marriage to Barnabas, and him eventually killing her. Today is the 50th Anniversary of Angelique cursing Barnabas with vampirism. I saw it back then. I was in 5th grade. It was the talk of the school the next day! Went through the storyline page. 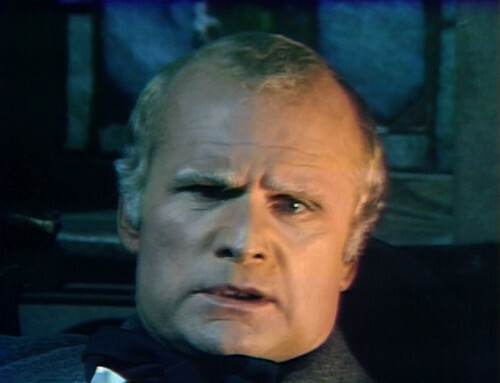 My first ep in 5th grade…Barnabas and Vicki in the hospital, and my DS buddy watching with me on the phone, trying to explain who and what, me having missed all of 1795, not knowing who the hell was Angelique, umm…just how am I going to catch up….Cure Barnabas, what? Of what, now? Addison Powell started out pretty good. And then they amped him up. And he couldn’t handle being the mad doc. Why am I watching this guy? But I went with it. Nicholas, love him. Cassandra, she’s who? Adam. In a chair with electrodes. Oh, we’ve got to stop the process. It gives me nightmares about the glowing and pulsing shower head. And now this brings them back. Nicholas makes her a vampire. And we’re off. This is where I start running home from school, or anywhere, not to miss a thing. This was the spark. Angie as a vampire. The hook. It took me that long. I didn’t need my DS buddy on the phone anymore. Yes, I remember watching it back then, too. It was the moment we’d all been waiting for. 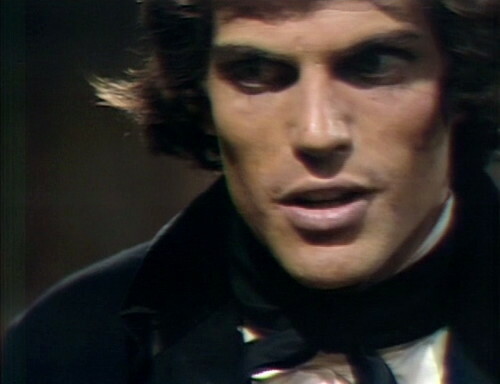 After all, we knew full well that the whole reason for the 1795 flashback was to reveal how Barnabas had become a vampire. 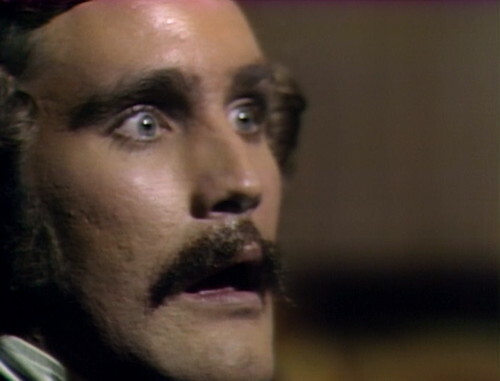 When Barnabas pulled out that pistol and shot Angelique, I practically jumped out of my chair with excitement. Something told me, “This is it! If he shoots her, she’s going to put the curse on him before she dies!” And she did precisely that. The only difference is that she survived the bullet. But the DS writers then did something that strikes me as quite brilliant. (I don’t often use the word “brilliant” to describe the writing on DS, but this one deserves it in my book.) When Barnabas strangled her after rising from his coffin, they made Angelique herself become the first victim of her curse on Barnabas — an ironic sacrifice to her own evil (even if it was later mitigated by the fact she didn’t stay dead). Those were the true glory days of DS, rivaled (in my opinion) only by Quentin’s haunting of Collinwood. Not that I even want to research it. But. A witch. Victim of her own curse. Somehow, that sounds like an original idea. On DS? Can’t be. But maybe? Aren’t there TWO pistols to the Deuling Kit? What do you have in YOUR drawing room? 1897, Quentin slings shade at Barney and wants to run him through. And busts up an antique lamp. Do they ever explain how she got back, when she shows up with Lazlo? It would have been a great opportunity to show her bickering with Diablos over it. And he gives her Lazlo. Catch. In other words, it’s all fun and games until somebody loses a head. Or finds a head – or a box. Well, OPENS a box. I guess you could say Desmond knows how to get ahead. It occurs to me that it seems a little soon to be killing core characters off already. I always liked Ben. He and I could be buddies. I don’t think I could say that of many other characters on DS. I thought it was too soon to kill off Ben, too. And yes, it would have been great to raise a tankard in The Eagle with Ben, there by a roaring fire on a stormy night; wouldn’t he have had some stories to tell? My guess is killing him off quickly was budget and time related re: his old age makeup. Can’t imagine Thayer David would be down for a daily routine like that. FYI anyone with Amazon Prime, almost every set is now available for free. They change every so often, so not sure how long it will last.